A new week & new month begins. What is on the cards for us this week? Like the weather report, let’s a take on what the Tarot suggests will affect us during the week ahead now March has begun. Using the Tarot like a weather report can have its uses. It’s March, so knowing that you’re going to need an umbrella is almost certain; wrapping up but not as much as you have been, is also good advice. What advice can the Tarot give us for March? This is a strange answer I feel: The Page is represented by the Otter, which are usually seen as playful & observant, intelligent & close-knit. I can see that in me for sure! The Ten of Stones as to what will hinder me is what gets me, though I can sense that the energies are what it may be going on about more. Look at the carvings in the doorway. There’s a male & female. It’s not the “home” in the physical sense, I feel it’s the home in the body sense. That being out of kilter will hinder me. 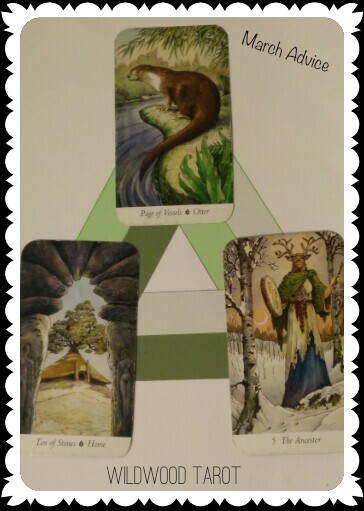 The Ancestor reminds me to be wise, that this is a gateway that I will pass through like I have all the others. There’s no right or wrong here, there’s a balance that I need to strike within me. Get it wrong and things may go off kilter. Get it right and I can be my playful, happy little self. The huge piece of advice comes from that wonderful anthropomorphic Ancestor. The calmness in the stag’s eyes, the drum that we see which can beat to its own tune & time. Take your time, beat this drum as fast as you wish, pass through this gateway as quickly as you wish, or not. The choices are yours to make: Always. I think though I’ll come in from that frosty, cold outdoors & sit inside my nice warm house, doing something constructive & helpful to others. Watch this space! Deck used is The Wildwood & images used with permission and credit to the creators; Mark, John & Will.